Many applauded the lightweight and comfortable construction of the Hoka One One Tracer. Most of the testers liked the design and color schemes of the shoe. Because of the lightweight construction, many noticed how fast the shoe is. The shoe features an innovative midsole that delivers a great combination of springy feel and underfoot protection. The shoe comes with a no-sew construction, providing a seamless interior to avoid blisters and irritation. Few testers complain that the forefoot is too narrow and there is no room for toe splay. A few runners with higher weight profiles noticed that the sole wore off quickly; according to Hoka, this shoe is recommended for those who weigh less than 85kg. The Hoka One One Tracer is a neutral running shoe that delivers a lightweight and breathable coverage for a comfortable run. It received mixed reviews from users but overall, the performance of the shoe is still impressive. This shoe is ideal for endurance training and also ideal for long distance and short distance runs. 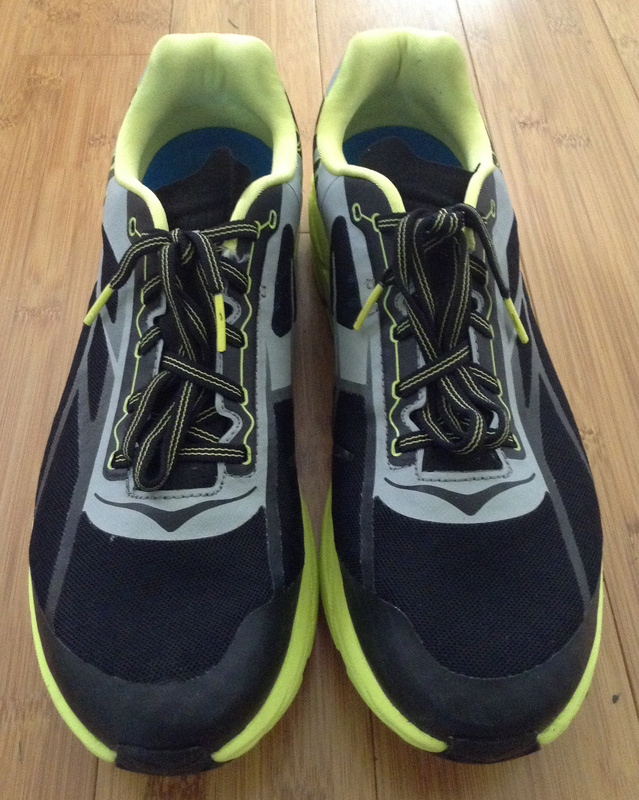 I am here to review Hoka One One’s version of a racing flat...the Tracer. Wait a second!?!? A racing flat from Hoka? For those of you who don’t believe it, I am here to tell you that it isn’t a dream. It is a reality! This Hoka shoe is a lightweight trainer that can be used for all distances from hard workouts to long runs. This model from the Hoka One One line is a fresh breath of air from the typical Hoka mold. The Tracers would be the equivalent of the Nike Lunaracer, Brooks Hyperion, or the Mizuno Wave Sonic. These are all lightweight shoes that are made for fast-paced workouts and races, but the Tracer allows for more versatility than the others. The Tracer is a revolutionary shoe that definitely changes up the typical Hoka One One mold. These shoes contain significantly less EVA cushioning foam underfoot which may appeal to some since the typical Hoka may look “dorky” or “ridiculous.” This has the relative appearance of a regular trainer. They also come in a few different color varieties on both the women’s and men’s sides of the spectrum. The color options are extreme in my opinion (and not in a bad way)! I like the color options they have, but wish that they did have a few more options to choose from. I currently have the Black/Citrus version since I found this pair on sale, but I really wanted the Citrus/Blue. I like to wear them for all different types of runs, from my easy to long runs and workouts, and the whole time they look great! The first thing to address about these is the lack of EVA foam that is customary with the Hoka brand, but have no fear! The amount of EVA foam has been diminished, but the same comfort associated with the Hoka brand is still present in these due to their innovative midsole. The ultralight construction of these does not sacrifice the supportive design of Hoka shoes. These also provide a snug fit around the ankle from a cushy collar and a very minimal tongue. As I said earlier, I was pretty shocked that Hoka One One came out with a racing flat which I figured they would eventually do, but not this soon. So far, I have used them a couple of times, and I really like the ride that they offer. I also stated earlier that they provide a smaller volume of cushioning underfoot, but it still has the vintage Hoka feel which is why I love them so much! When you are out doing a hard workout or a long run or even just doing an easy run, your legs will undoubtedly get tired and fatigued. These shoes offer comfort when others don’t. As the run gets longer, some shoes seem to get stiffer in the sole and cushioning. Tracers do not. They provide the same soft cushioned ride from start to finish just like every other Hoka on the market today. When you don’t have soft EVA foam underfoot, there is a solid chance that you will feel sorry for yourself and ask yourself why do I punish my impeccably good looking legs and body with such exercise? Why don’t I just do the elliptical, stair climber, or bike? To continue boasting about the Tracers, I also love how responsive these are. Responsiveness is a key component of any racing shoe. These have a whole bunch to offer. Tempos and fartleks feel really nice in these since it feels extremely springy which helps propel you and keep you moving. For me, the Hoka One One Tracer running shoe is an incredibly lightweight alternative from the classic Hoka mold. These shoes still implement the same type of cushioning as their counterparts, so you still get a similar feel. They are fairly breathable and responsive to propel one forward. Versatility is another great thing about them. The only issues that I have heard or seen are that they are narrow and the durability is questionable. Personally, I went a half size up, and they have enough width for my wide feet. I have not noticed any issues with durability in my Tracers so that would be something to watch out for. The Hoka One One Tracer is a lightweight neutral trainer that has incredible versatility from being a racing shoe all the way up to a long run day shoe. For its retail price of $130, I would say that it might be a tad too much for your weekend warriors. The release of the Tracer 2 has brought its price down from $130 to $105 on the Hoka website, but you can surely find deals where you can get them for $70-$90. I recommend anyone reading this to test them out since I really like them and they will probably become an all-around workhorse for me in the future. They offer the speed of a racing shoe. They offer the cushion that is associated with the Hoka One One brand. Try them, and I hope that this has helped you out! Although being much plusher than a racing flat, the Tracer does not fail to give the same snappy feel I get from my other racers. Being a racer, the Hoka One One Tracer really performs both on the track and on the road as I would expect of such a shoe. The place where this shoe really stands out, in my opinion, would be during longer workouts such as tempo runs. The added cushioning this shoe has made running in it for extended periods feel comfortable. Similar to the Clifton 2, the Tracer has an amazing heel to toe transition thanks to its design. One thing I really like about this shoe would be the laces. It may seem like a very trivial thing, however, the stretchy laces on the traverse allow me to get in and out of the shoe quickly. It secures my feet, stopping it from rocking around in the shoe. One other aspect of the shoe that I appreciate would be the tongue. The tongue of the shoe although not being padded still has the ability to be very comfortable. There is no stitching on the inside, reducing the chances of me getting hotspots when I do my long runs in the shoe. The upper of the Hoka Tracer has no stitching, making it very comfortable to run in, giving an almost sock-like feel. Also, the welded overlays on the upper are less prominent in the Tracer. Compared to the Clifton 2, the welded overlays restricted my foot movement and resulted in me developing hotspots at the forefoot area. In addition, the upper is nice and breathable allowing me to run comfortably in hot weather. This is not to say that the upper does not have its own set of problems. One major problem I have encountered is that the fit is still quite narrow in the Tracer although not as bad as Clifton’s fit. The lack of room in the forefoot area has made my feet feel cramped at the front of the shoe. This is why I feel that the tracers would suit a runner with a more narrow foot. The Tracers has a responsive ride. Heel to toe transitions in the shoe is extremely smooth. The Pro2lite+10 midsole material used on the Tracer is one of the things that make running in the Tracer an absolute joy. The midsole both has the ability to remain springy and responsive. This makes the experience running in the shoe very unique and enjoyable during quicker workouts. Another thing that contributed to such an enjoyable ride is the low heel drop at only 4mm on the shoe. The low heel drop has made running in this shoe more enjoyable. The midsole of the Tracer is thicker than most racers with a stack height of 22mm. For runners who require special insoles for a range of foot conditions, the Tracer would be a suitable shoe as it has a removable insole. The insole on the Tracer is similar to the one found on the Clifton which is really comfortable. The heel counter of the Tracer fits me very well as it does not dig into my Achilles tendon, reducing pain. Besides, the heel counter is padded which makes running in the shoe very comfortable as compared to racing flats such as the Nike Streak 6. The outsole on the Tracer is definitely grippy enough to be used on a variety of surfaces such as the road and the track. It also has no problem tackling a wet track. One thing to take note of is that although I have only used the Tracers for around a month, areas of the outsole that has no rubber covering has seen visible wear. For runners looking for a quick snappy racer that has more than enough cushioning, the Hoka One One Tracer is a good shoe. Although the fit of the shoe is a bit too narrow for my liking, it has not stopped me from loving it. This guy would be more than enough for the Marathon. I wouldn't worry about distance with this shoe. Even with the lower stack height, there's plenty of cushioning there. These shoes look great. The combination of cushion, light weight, and responsiveness makes it a great 10K-to-Marathon racing flat. The Hoka One One Tracer features the dual density Pro2Lite midsole that delivers a good combination of propulsion and protection. This helps runners experience a more responsive ride while having enough underfoot protection when necessary. The shoe also features the breathable forefoot mesh that allows air flow. It reduces water retention, keeping the foot moisture-free and odor-free. When it comes to sizing, the Tracer runs small and purchasing a half size larger is advisable to get the right and comfortable fit. The heel and midfoot delivers a snug fit and the forefoot is a bit narrow, making it ideal for those narrow-footed runners. 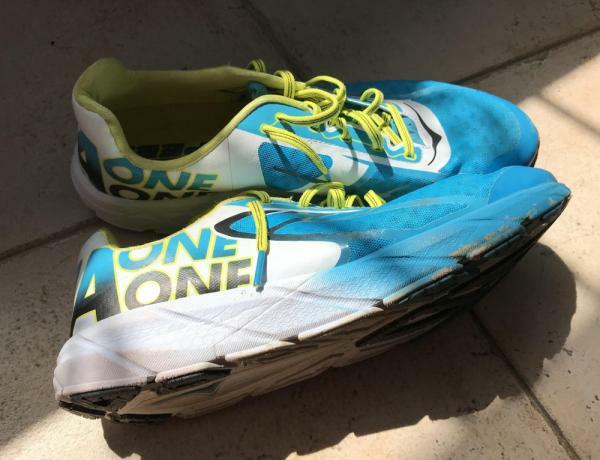 Hoka One One is offering this shoe in standard D width for men’s and B width for women’s version. The outer sole of the shoe uses the RMAT outsole material that gives reliable traction while running on the road. It also gives added cushioning that provides high energy return for a more responsive ride. Also same as in the popular Hoka One One Arahi 2, High Abrasion Rubber is also used in the sole's unit. It is strategically placed in high wear areas to provide added durability. Just like the shoe's recent version, the Tracer 2, the shoe's midsole uses the dual density Pro2Lite +10 midsole material that provides enough amount of cushioning when needed. The heel area has a soft cushioning and the forefoot has a firmer cushioning, delivering a great combination of protection and propulsion. With the Early Stage Meta-Rocker Geometry, runners can experience efficiency in their running mechanisms. The Hoka One One Tracer features a lightweight and breathable upper coverage. The structural overlays deliver the needed structure in the midfoot. The no-sew construction delivers a seamless environment for the foot. It helps reduce blistering and irritation. The seamless TPU overlay construction provides added support and comfortable fit. Lastly, the shoe comes with an ultra breathable forefoot mesh that allows efficient airflow. It keeps the foot drier all throughout the run.